Your itinerary - determining which day you are visiting each theme park - is the foundation for building a great Florida vacation. Many people assume that the crowds are equally dispersed but this is not true. There really are Best Days or at least Better Days for each of the theme parks within a period of several days. This is crucial information for families visiting during holidays or school breaks when crowds are high. Traveling off season doesn't eliminate the need for a good itinerary either because you need a schedule that adjusts for lower park hours and decreased numbers of performance times, shows and entertainment. Take a look at the image below and you'll see what I mean. MK = Magic Kingdom and the crowd levels are on a scale of one-to-ten. 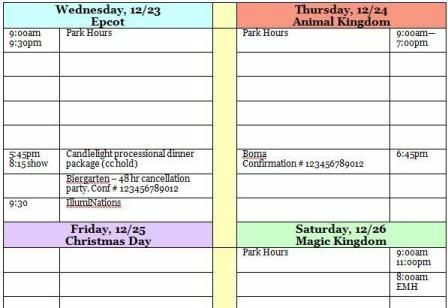 Which day would you rather be in the Magic Kingdom? A number of factors contribute to how busy one theme park is in relation to the other parks on any given day. You need to know how Extra Magic Hours - special times that the parks are open only to guests of official Disney World hotels and select 'Good Neighbor' hotels - are going to affect you, whether you are a Disney resort guest or not. Certain parks may close early because of special events. Holidays can cause spikes in attendance at one park or another. Parades, shows, and fireworks are not always offered every day and some days have more live entertainment than others. Knowing where you'll be on a particular day makes it so much easier to booking dining reservations that don't require you to travel all over Disney World. We want to make vacation planning easy for you and we have “Best Days” information that will help you get the most out of each day of your trip. We will be happy to build a Personalized Vacation Itinerary around your specific trip dates when you book your Disney vacation through Build A Better Mouse Trip. After working with you to figure out where you'll be, we will also book any dining reservations (subject to availability) you want at times that let you enjoy your meal without missing any parades, fireworks, and shows that are important to you. Your custom itinerary will include park hours, show times, and reservation confirmation numbers. Our clients find that our help with their itinerary really sets the stage for a great experience. The best part is that we are a "Fee-Free" travel agency which means you get our help and you never pay a service charge or other fee for our services when you book your vacation through us. You can also purchase our planning services separately if you've booked your trip somewhere else. We book directly through Disney and Universal to make sure you get every benefit they offer and then you get all the benefits and services we offer. We even provide free theme park touring plans to help you stay ahead of the crowds and out of the long lines and there is no additional cost of any kind. Click here to find out more about Disney theme park touring plans. We also offer itinerary planning for people who don't need accommodations. In this situation, you just pay a flat fee for each planned day and we'll map out an itinerary for you, book dining reservations (subject to availability) and provide theme park touring plans to help you have a great trip without having to worry about the details. We send it all to you via email or we will send printed copies for an additional $15. You can use the contact button below and add a note to the comment section letting us know that you are interested in our itinerary service. If you have a Disney package that was booked less than 30 days ago, you may still be able to get our services for free just by having us named as the "travel agent of record" for your package. Contact us for details on this option and we'll be happy to tell you all about it.